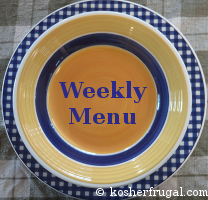 This week, we plan to do sandwiches and fresh vegetables for most lunches. Simple and no fuss. It is far too hot for fussing. Also not doing much shopping that I know of! We'll need some milk,eggs, a few fresh fruits and vegetables, and chicken for shabbat. That's all I plan to buy. I try really hard to buy veggies for less than 5 shekels/kg, and definitely favor the ones that are 2 shekels/kg or less. Hoping I luck out this week! Right now we've got purple cabbage, cucumbers, carrots, and kohlrabi in the fridge, and tomatoes on the counter. It should get us through the first half of the week!